plagiarist: The Most Sensational, Inspirational, Celebrational, Muppetational Reality TV show? 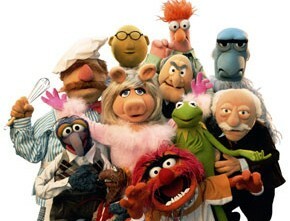 The Most Sensational, Inspirational, Celebrational, Muppetational Reality TV show? It was only a matter of time before the reality TV craze hit our little plush friends. Variety reports that ABC has ordered five episodes of America's Next Muppet, a "reality" series parodying American Idol and America's Next Top Model in which viewers choose a new colleague for the now Disney-owned Muppets. While some remain skeptical about the Muppets' new venture, we're excited that our childhood favorites will be back on air for, of all things, a reality TV spoof. Though we wonder -- will aspiring muppets break down crying in each judging as in ANTP? Who will judge -- probably Statler and Waldorf? Maybe Miss Piggy for the diva factor? We can only hope the Swedish chef at least merits a guest-judge spot.